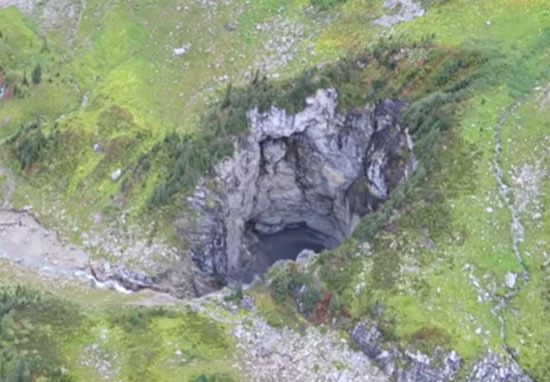 People in Canada have stumbled across a cave which is one of the largest in the country, but no one’s ever seen it before. 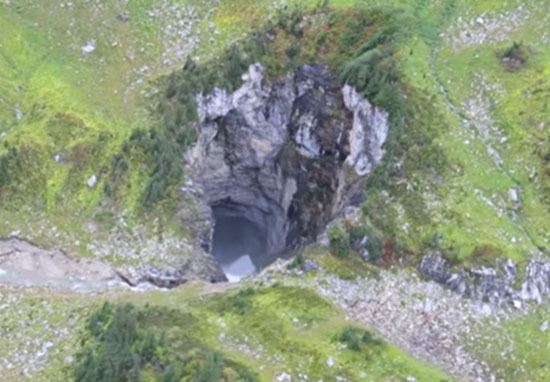 The huge cave was discovered by a team of staff from the Ministry of National Resources, a government ministry which is responsible for Ontario’s parks, forests, fisheries and wildlife. The staff were in a helicopter when they first spotted the cave in April, in the midst of a routine exercise involving them counting caribou – which, after a quick google, I’ve learned are basically large reindeer. 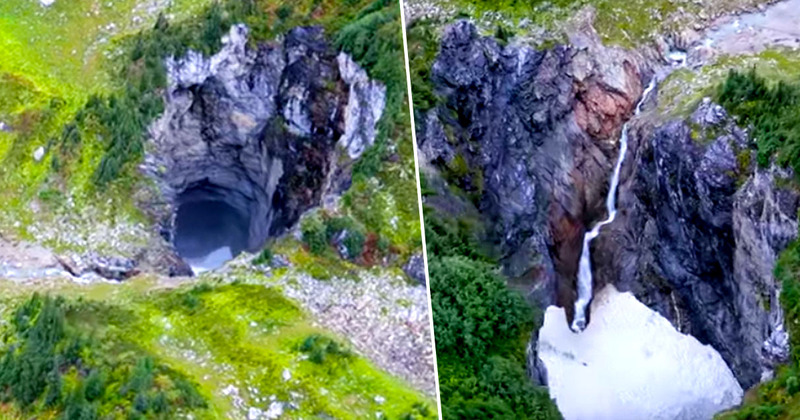 While surveying the land for Santa’s oversized sleigh-pullers, those in the helicopter spotted the tell-tale gaping opening of the mysterious cave in Wells Gray Provincial Park, British Columbia. My immediate reaction was that there can’t be a cave there, it’s impossible. It is huge. It is enormous. When you first see it, you just gasp because it’s just this huge hole in the ground. At the moment [the cavers are] saying it certainly is one of the largest in Canada. Those investigating the cave have also appealed to the public to ask if anyone knows anything about it or its history. The cave is so gigantic that the mouth alone measures 100 meters by 60 meters, while inside it reaches depths of more than 100 metres underground, with a straight vertical drop for the first 80 metres. After going unnoticed for so long it’s lucky no one fell into the cave. I can’t imagine stepping from firm ground to oblivion would be a pleasant way to end a nice day wandering the park. You might think it ridiculous that something so big could go unnoticed for so long, but there’s one simple explanation as to why it remained concealed. I’ll give you a hint – this cave was in Canada, where their idea of a mild winter would probably involves several feet of snow. You guessed it, Hickson explained the team thinks the cave has gone unnoticed because it was likely to have been covered by snow year-round until some point in the last 20-50 years. She added it was pure luck the team flew over the cave when it wasn’t obscured by whiteness, and since the initial sighting of the cave experts John Pollack and Lee Hollis have been spending time studying satellite imagery before flying to the site on September 9 to get a closer look. It’s this vertical huge hole and you can imagine a space monster like the Sarlacc occupying this pit. Despite the not-so-inviting name, brave caver Lee Hollis made a descent into the pit, rappelling about 100 metres down into the depths before he was met with water, ice and snow. The team are now fundraising for a more thorough exploration of the site, which they hope will take place in 2020.